Join the greatest daredevil of all time in his latest expedition! Click here to play! Make all of the jumps and you will be loved and adored by the crowd, not to mention the excessive cash jackpots you will receive! 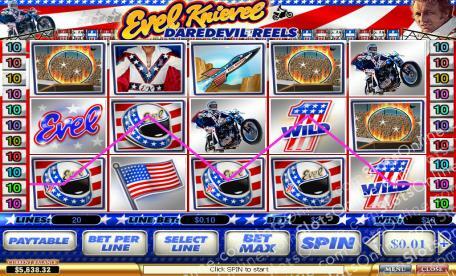 Evil Knievel Daredevil is a spine tingling slot played across 5 reels and 20 unique pay lines. The Number 1 is Wild and can become any other symbol, except Scatters and Bonuses, in order to complete winning combos. If you manage all 5 you will also be paid out 10,000 coins. The Evel logo is Scattered and can appear anywhere on the reels to win a payout of up to 500 times your wager. Finally, the Motorcycle is a Bonus symbol and when three or more of them appear on an active pay line you will be sent straight to the lucrative Bonus Round. Strap yourself in and hold on tight because Evil Knievel Daredevil is an exciting adventure filled with cash jackpots! Evels are Scattered and will payout whenever they appear on reels up to 500 coins. The Number 1 pays out up to 10,000 times your wager, and can substitute for most symbols on the reels. The Motorcycle symbol is a Bonus, and when three or more appear on an active pay line the Bonus Round will be triggered.